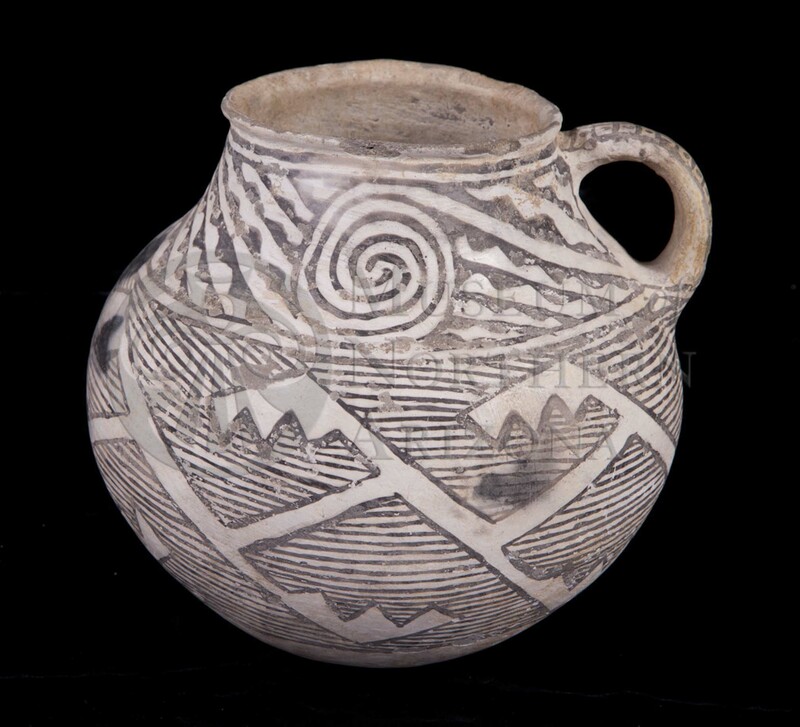 Padre Black-on-white jar or pitcher from the Museum of Northern Arizona collections. Click the image to open the Padre Black-on-white gallery. Padre Black-on-white is a Little Colorado White Ware found primarily in the lower parts of Walnut and Padre canyons, but although across the Little Colorado River valley. Date Range: A.D. 1075-1200 (per Christian Downum, Northern Arizona University). Temper: Crushed sherd (appears as abundant white, gray or tan angular fragments); quartz and volcanic rock fragments, especially augite, are common. Surface Finish: Bowl interiors and jar exteriors coated with fairly heavy white or gray slip, well-polished, sometimes crazed, bowl exteriors usually scraped, not smoothed, often bumpy, pitted coated with chalky slip or wash, rarely finished and slipped on interiors, interior jar surfaces fairly carefully smoothed, scraping marks noticeable, fine and uniform; sometimes chalky white wash inside neck, slip frequently flakes off, scraping marks often noticeable through slip. Surface Color: Gray or white. Forms: Jars, bowls, and effigies. Vessel Thickness: 4.9 to 6.4 mm (bowl walls); 4.9 to 6.4 mm; average thickness 5.7 mm (jar walls). Paint: Organic paint, gray to black, soaks into the slip. Design: Usually interior surfaces of bowls, only exterior surfaces of jars; Dogoszhi, rectangular and triangular panels usually containing narrow-line hatchures, sometimes fairly coarse rectangular cross hatchure, framing lines about the same width as cross-hatchure, or slightly wider, occasionally solid triangles and stepped elements combined with hatchure. Comparisons: Dogoszhi Black-on-white is usually not noticeably slipped, surface gritty, paint somewhat more watery, hatchures slightly narrower with spaces between often slightly wider than hatchures, panels usually smaller, temper fine quartz sand. Hays-Gilpin, K., and Eric Van Hartesveldt. (1998) Prehistoric Ceramics of the Puerco Valley: The 1995 Chambers-Sanders Trust Lands Ceramic Conference. Museum of Northern Arizona, Flagstaff, Arizona.